When the Ethiopian capital was founded in 1887 by Menelik II, it was given a name of "Addis Ababa", which translates to the "new flower" in Amharic. Just like a flower, the new city would need maintenance, patience and care to blossom into something spectacular. Unfortunately, the beautiful city and new begening Menelik envisioned for Addis Ababa hasn't happened. Decades of neglect and mismanagement has made the city look unappealing and unlivable for many of its citizens. Just how bad have things gotten in Addis? 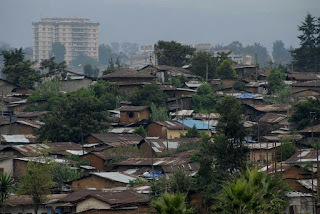 According to the United Nations, Addis has one of the highest densities of slum dwellers in the world. Recently, Addis was ranked as the 6th dirtiest city globally by Forbes Magazine. The capital also suffers from a wide-range of social issues such as excessive panhandling; poor sanitation conditions; and a prostitution epidemic. In fact, one in every twelve women residing in Addis today are prostitutes; which is likely why many tourists have dubbed Addis the "Bangkok of Africa". 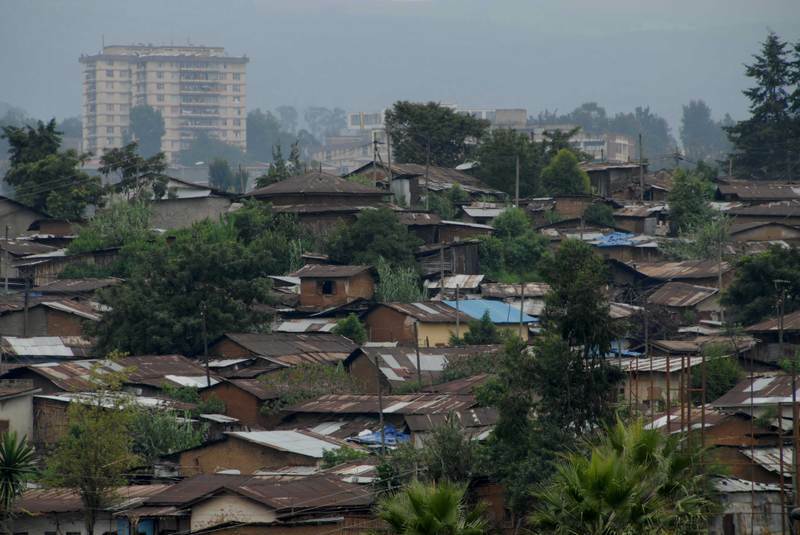 According to government statics, 24% of inhabitants of the city lacked access to adequate toilet/shower facilities and a staggering 30% of Addis residents now live below the absoulte poverty line. Since taken power in 1991, Meles Zenawi's attempt of leaving his footprint on the city has exasperated the situation by frantically constructing buildings that consist of ugly steel-and-glass towers that has made the city look mundane and lacking architectural enthusiasm. Just about all the buildings being built in capital these days are not up to par with international safety standards. In order to save costs, many state owned construction firms are developing buildings that lack fire escape routes and adequate plumping. Additionally, the construction boom being witnessed in the city does not harmonize with Addis Ababa's Master Plan, which was created between 1984 to 1986 by a joint Italian and Ethiopian administrations. The government should focus on building large parks and recreation centers within the capital. It should also invest in landscaping and sidewalks for pedestrians. Additionally, the government should concentrate more on quality, rather than quantity and start developing buildings in accordance with the city's master plan, so the true character of Addis can be defined. As for the social issues, the government needs to clamp down on panhandling and prostitution and give those disadvantaged citizens opportunities to earn a living. The challenges facing the capital are enormous and only long-term solutions can revive the city from its dismal state. Government officials and urban planners must reverse course before the city completely looks and feel like a giant 3rd world glass-and-concrete slum.